It's almost Independence Day here in the United States and also a great soccer time for USA in the World Cup!!! If you are from this country or live in this country, then it's time to break out your red, white, and blues. I went ahead and wore this patriotic and preppy look last week to go downtown and watch United States soccer game, then, we sealed the evening with a patio dinner. This week I'll continue cheering for my second home USA (Honduras is already eliminated), so I'll be wearing outfits with patriotic colors all the way to the 4th of July. I'll try my best to share with you pictures. Es casi Día de la Independencia aquí en Estados Unidos y también es un tiempo perfecto para el fútbol en la Copa Mundial!! Si eres de este país o vives aquí, entonces es hora de lucir tus prendas de color rojo, blanco y azul. Yo me adelanté al asunto y me puse este conjunto patriótico la semana pasada para ir a ver uno de los partidos de Estados Unidos en un cinema del centro de la ciudad. Luego sellamos la noche con una cena de patio. Esta semana voy a continuar apoyando a mi segundo hogar Estados Unidos (Honduras ya esta eliminada), así que me voy a vestir de los colores patrióticos hasta el 4 de julio. Haré todos mis esfuerzos para compartirles algunas fotos de los looks de esta próxima semana. 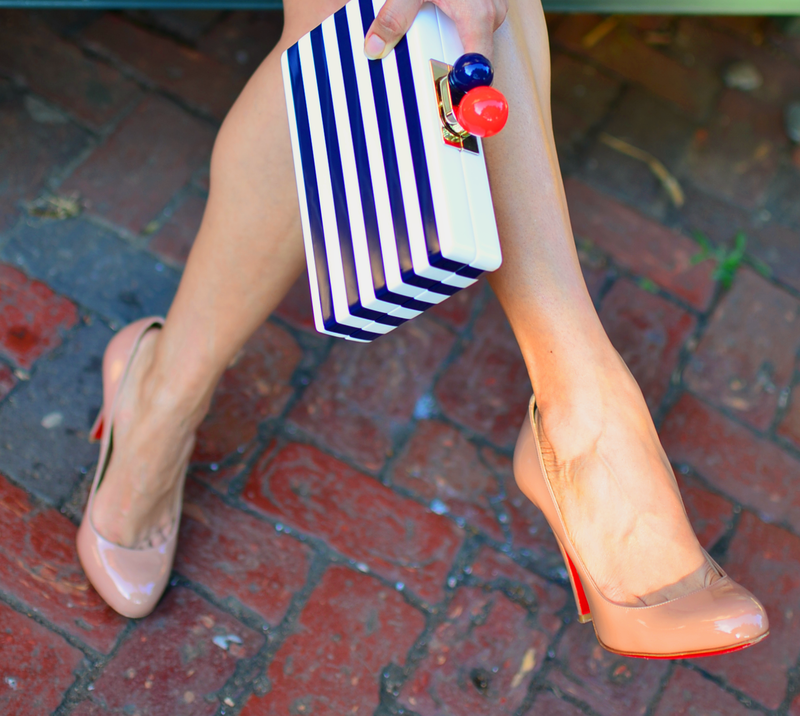 Pumps/Tacones: Christian Louboutin "Ron Ron"
Love, love, love this classic outfit!! That clutch bag adds an expected pop of fun!! So cute! Very nice look. You made the more structured look of the skirt look at ease with the chambray shirt. Love the clutch too! What a great outfit and so lovely on you! The skirt is excellent with this blouse and I love the bag and the shoes. Happy 4th! Guapísima en la propuestra preppy ! feliz día de la Independencia !